With the formal Wedding Garden and Pergola for a backdrop, the Gazebo makes a wonderful location for smaller, more casual weddings. 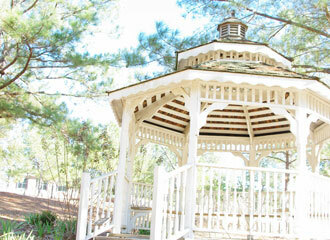 Shaded by southern pines and surrounded with oakleaf hydrangeas, the Gazebo is also right next to the Love Gate. Be sure to ask our staff about how you can incorporate this fun tradition into your ceremony!